IT Unit, FRIM. supported the website hosting services till 2015. The very diverse types of forests, typical for tropical and sub-tropical countries, in Southeast Asia, have been providing various different types of ecosystem services. Likewise, there are many indigenous groups that have been residing in and around these forests, with diverse culture and rich traditional knowledge. Many of the traditional knowledge directly or indirectly contributing to sustaining the various ecosystem services which are crucial to their livelihood and wellbeing. Prompted by encouraging early results from questionnaire surveys conducted in Korea to document traditional knowledge related to ecosystem services, the National Institute of Forest Science (NIFoS, formerly known Korea Forest Research Institute (KFRI)) has contacted the Asia Pacific Association of Forestry Research Institutions (APAFRI) to engage other Asian countries in this initiative. Five countries: Cambodia, Indonesia, Malaysia, Philippines and Vietnam, participated in this initiative. 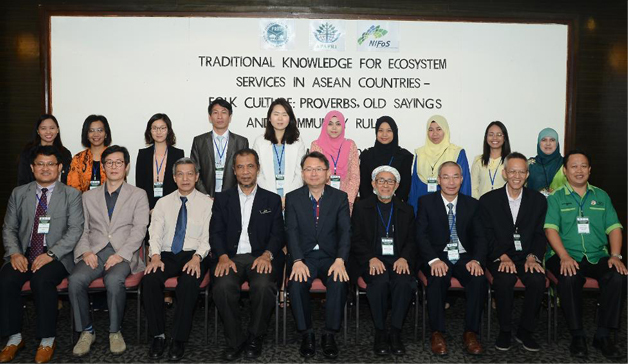 The outputs were presented during a workshop convened in Kuala Lumpur, 2-4 February 2015. The undertakings to document traditional knowledge related to ecosystem services have stirred up much interest. Many more similar knowledge, some may have been long forgotten, could still be relevant to the present days, warrant detailed study and proper documentation. These traditional knowledge, more often than not, are being passed down the generations by words of mouth, often then in the form of proverbs, poems, folk tales, or songs. Some have since time immemorial, been encrypted into rituals, customary practices, or even community rules and regulations. The National Institute of Forest Science had initiated a project documenting and analyzing old sayings and proverbs related to ecosystem services in Korea. NIFoS is interested to extend this project to cover other countries in Asia Pacific region, especially in Southeast Asia. Relationships Between the Traditional Beliefs and Practices on the Agricultural Land, Forest Resources, River Resources and Conservation by the Dusun People in Tambunan District, Sabah, Malaysia. How to map the Tangible Resources of Cultural Ecosystem Services in ASEAN Countries?